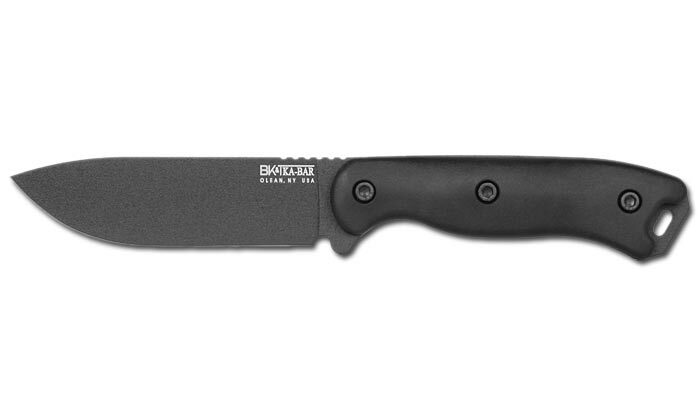 Designed by Ethan Becker, BK16 survival knife from Becker Knives series, manufactured by Ka-Bar company. Trailing Point blade type with full tang construction is made from one piece Cro-Van 1095 steel with a hardness of 56-58 HRC. Is additionally coated with matt black layer, protecting against glare and corrosion. The handle is made of durable Ultramid® material with rough, anti-slippery texture. Against slip off the hand on the blade during use protects special shape of the handle and top of the blade with special cuts. The end of handle has a hole for cord. It can also serve as a glass breaker, etc. Includes a tactical sheath with sewn pocket made ​​of nylon in desert TAN color and spare linings in the Coyote Brown color.